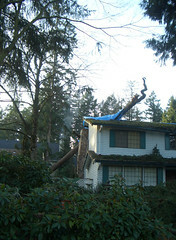 One of the houses in my neighborhood that got hit pretty hard in the storm. Looks like it was a bedroom - hopefully no one hurt. Note the broken chimney as well. That can't be cheap to fix! It's not cheap. And I hope the tree was on their property, otherwise, it becomes a tricky situation!